Our new Attachment Tracking feature allows you to see how your recipients are viewing the files you attach to your email, page-by-page. 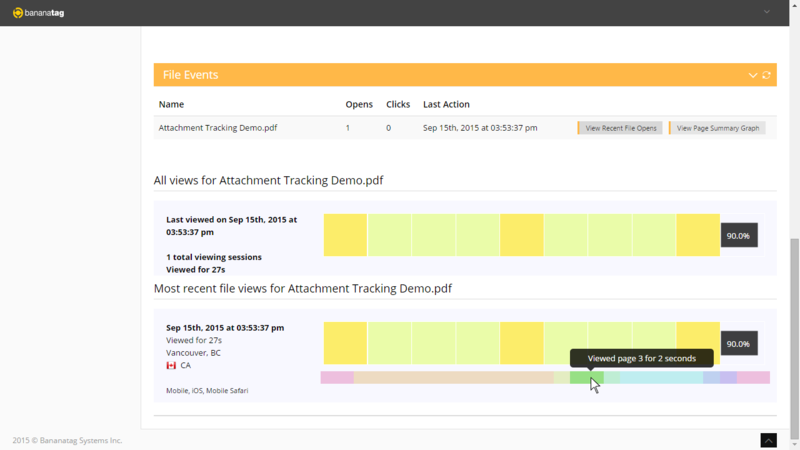 Here's how to get started with tracking your attachments. 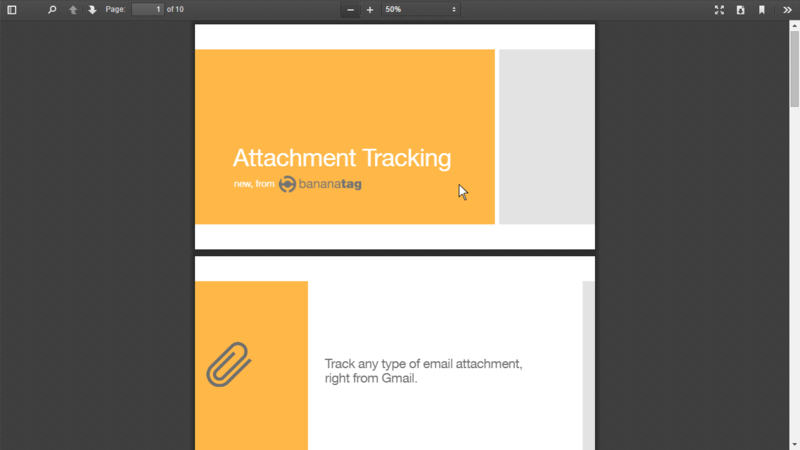 Attachment Tracking is available for users with a Bananatag Pro plan. Make sure you have the latest version of the Bananatag extention for Chrome or Firefox. You should see new features in the compose window, including the Track, Upload & Attach, and Templates buttons. That's it! Your attachment is now tracked. 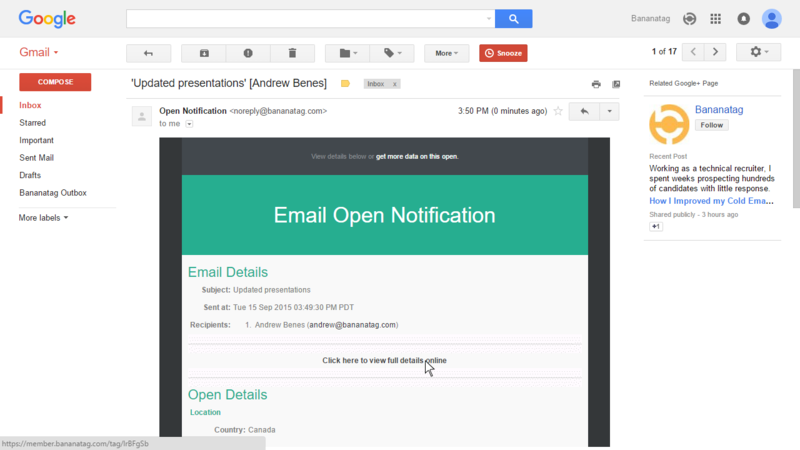 If you're using our new Email Templates features, you can also save templates which include attachments so these are inserted and tracked along with your template. In the example above, we see that a recipient quickly viewed this PDF presentation for 27 seconds on an iPhone, and that they scrolled through nearly all of the slides (90%) before closing it on their device. Using the Manage Attachments function, accessible by clicking the upward arrow beside the Upload & Attach button, an interface is available to re-insert files which have been used previously. There are two main benefits from using this interface to attach files you plan on sending more than once -- you will no longer need to re-upload the files you send most often, and the engagement data for each view will also be aggregated to show you how each attachment is being viewed by all recipients that have received it. 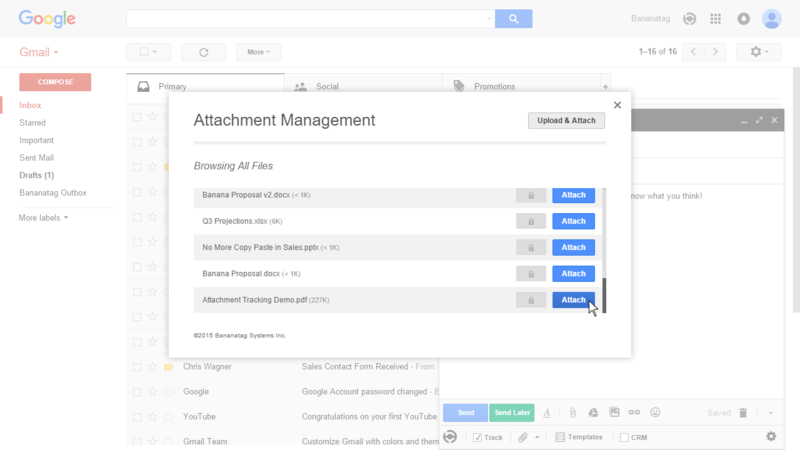 Get a free download of Bananatag for Gmail , see information on plan types and start tracking your emails and attachments!